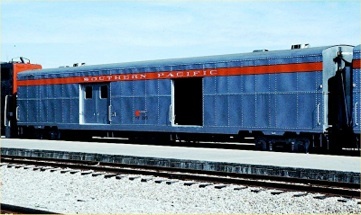 Southern Pacific 6706 is one of 200 “Economy” baggage cars (SP 6601-6800) built for the Southern Pacific in the early 1960’s. By the late 1950’s, maintenance costs were catching up with the SP’s older baggage and mail cars that were on the roster since the 1920’s and 30’s. To alleviate the situation, the SP purchased 100 new lightweight baggage cars from the St. Louis Car Co. in 1960. A second order of 100 similar cars was placed with Pacific Car and Foundry and delivered in 1962. These cars were rather plain, hence the “economy” name, and built entirely of steel in conformity with American Association of Railroad (AAR) standards as well as U.S. Postal regulations. The cars were painted in the solid dark gray scheme with white (silver-gray) lettering. The car is currently in use as the storage car for the Train of Lights interior decorations.